I'm using Outlook 2007 and Outlook 2010 against an IMAP server (the problem exists across many, like Gmail, you name it). Outlook lets you set your Outlook "Sent" folder to map to the IMAP server's Sent folder (the other choice is to map your Outlook Sent to your Personal Folders Sent) - this is good. When you send a message from Outlook and then look in the sent folder of the IMAP server (e.g. from a different client or from a browser), the messages are there. This is the behavior I want. Outlook does NOT support the same behavior for Drafts and Trash. 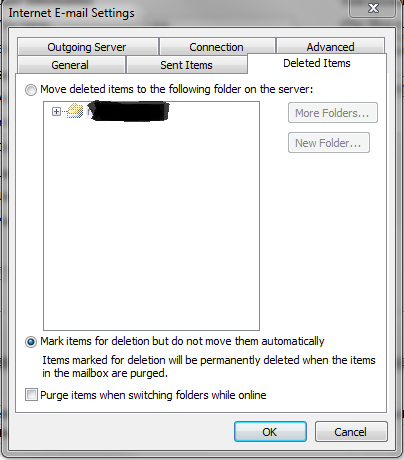 In both cases, items deleted (or Drafts saved) in Outlook go in to Outlook's local folders and do NOT show on the IMAP server's Trash or Drafts folders. Same problem in reverse. Thunderbird on the other hand does support the proper mapping of Drafts, Sent and Trash. I expected this to be IMAP-specific but it appears to be client specific. What does Outlook implement it this way and is there a workaround? Slight correction, you can change the Trash/Deleted folder as well, indicated by the screenshot below. The only folders you can't remap is the Drafts and Junk Mail folders. There is no workaround. I have found this frustrating myself and the same behavior exists in Office 2011 for the Mac. There was a workaround for 2003 but it fails in 2007 and higher. As for why, any reasons except an official response from Microsoft would be purely speculative. I am guessing it is due to the way office rules are linked to the folder locations. A possible work around would be to impliment a rule or macro to copy the contents of your outlook data file draft folder to the imap draft folder. Having said this, I cannot find a rule that acts on messages within a folder. Does anyone know how to do this? select (click once) on your AOL IMAP/SMTP account beneath "Name"
In the "General" tab, check the "Purge Options"
You may also wish to select the "Folders" tab and check "Choose an existing..." and select the "Sent" folder under your AOL root; this way you can distinguish which e-mails were sent from AOL vice another account under Outlook 2007's "Personal Folders" root. Not the answer you're looking for? Browse other questions tagged microsoft-outlook microsoft-outlook-2007 thunderbird imap microsoft-outlook-2010 or ask your own question. How to configure all the special IMAP folders in Outlook?